I was cruising around Pinterest, like always. I love looking at pretty party dresses that I will never have a reason to wear. (I don't get out much, and certainly not to cocktail parties.) If I've learned anything from my minions, it's that sometimes it is fun to play dress up...even if I can only do it on my nails. The glitter I used isn't a perfect match. 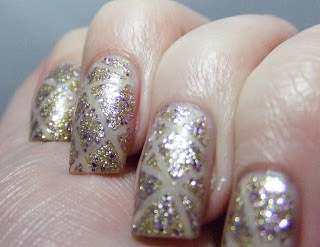 Big Money has round lavender bits pretty densely packed into the champagne micro-glitter. But I could not, for the life of me, find a good champagne glitter! I thought about getting Essie's Beyond Cozy, but I couldn't find it. Polish shopping is pretty iffy around here. I think it kinda works with the lavender though. It's not near as noticeable in person. No way in hell was I going to drop $650 on a dress. Not to mention that I kinda think the actual dress is ugly on the mannequin. I think it's one of those dresses that needs a certain kind of girl to wear it. I am NOT that girl. I'm actually still wearing this. I kinda love it. a small note: I've been testing out a yellow blocking basecoat that I picked up at Sally Beauty. So far, it's working out quite well. As you can tell here (back before my nails were totally stained) Dune is pretty sheer even at 3 coats. If you like wearing semi-sheers, check this stuff out. Well done! I tried a glitter striping tape mani on my mom and it was a nail FAIL so I applaud you! it was a major pain. I had a few toothpicks handy to scoot errant glitter back into line. The worst part: it's scratchy! Pulling the tape up moved bits of glitter around, and some stand straight up. It is still on my nails, and I can't leave it alone!